Rice cooker is a kitchen appliance that is used to cook rice. These appliances operate either on gas or electricity. These days’ people prefer kitchen equipments which are convenient and save time. It means that the equipments which operate on electricity are better suited for today’s household as the risk of a gas leak and fire is nullified. Cooking rice is a major hassle when done in an open pan as you have to constantly monitor the progress or else it might get burned. This is where the small rice cooker comes in handy. It is completely automated and has an in built timer which turns it off once the rice is cooked. All you have to do is make sure that the grain and water content is accurate. Most of these cookers come in with instructions and water level marked on it. A small rice cooker or any rice cooker consists of a removable bowl which rests on a thermostat and a heater. There is a spring which makes the contact between the thermostat and the bowl possible thus providing the required heat. Once the rice grains are rinsed properly it is added to the bowl with the required amount of water (generally 1½ cups of water to 1 cup of rice, although it can be altered as per your requirement) and switch on the cooker. The rice is cooked inside the cooker and there is no spillage of water as the temperature never goes beyond 100*C. The rice absorbs the steam that is generated by the heating water and becomes fluffy. Once the rice is done the cooker turns off automatically, however it does keep on heating the rice so that it does not dries up. This process is maintained by the thermostat which keeps on heating as soon as the temperature drops below the permissible limit. Once the lid of the cooker is opened the thermostat stops the heating process and fresh, fluffy, tasty rice is ready to be eaten. If the rice is not consumed immediately, make sure it is refrigerated in an air tight container so that bacteria do not grow on them. 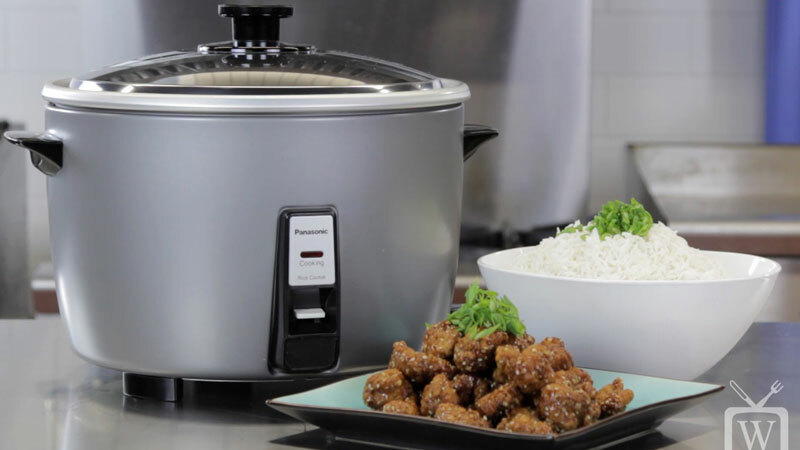 A rice cooker will also cook cereals and pulses quickly which will help you in preparation of a hearty meal for the family or arriving guests. When buying a small rice cooker do make sure to check the manufacturer’s guarantee and the instruction manual so that you proper equipment suited to your kitchen. A rice cooker box should contain a measuring cup along with a spatula so that the inner coating of the cooker is not spoilt by stains and scratches of other utensils. This is an important factor as replacement bowls are very expensive and more often than not they do not match up exactly to the original one. A small rice cooker is handy equipment in the kitchen and does not take much effort in cleaning it as well. Rice cookers can be dismantled easily for washing, cleaning and storing. The inner bowl is dishwasher safe, however do not in any circumstance put the thermostat and heater in water as that will spoil the whole mechanism of the equipment.